Rick then emphasises how very recent growth has been with this chart. Note that the x-axis compresses as the dates advance, which makes the growth rate appear greater for later dates. He uses this chart to suggest that most of the growth in incomes has actually occurred since the 1950s, which is entirely true in an absolute sense. 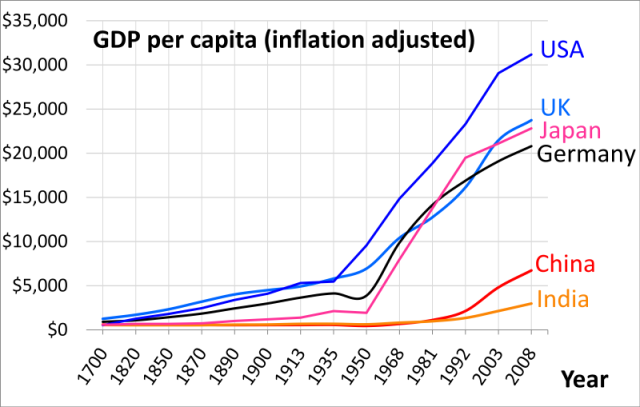 But now look at how steady UK GDP growth looks if I plot it with an even x-axis and a log y-axis to account for the exponential nature of growth since the Industrial Revolution. The two World Wars cause noticeable spikes in output followed by sharp falls, as expected: war output tends to be funded by borrowing, kills millions of people, and destroys productive assets. Despite that, a prediction of 2 per cent growth back in 1800 would have been fairly accurate for the next 200 years. Herein lies the problem for extrapolation from trends. We’ve had 200 years of fairly steady growth that encompasses multiple world wars, the fall of numerous empires, the steam engine, motorisation, computerisation, flight, and many other life-changing technologies. It’s difficult to argue that the past five years have seen greater upheaval, such that growth must be permanently changed. 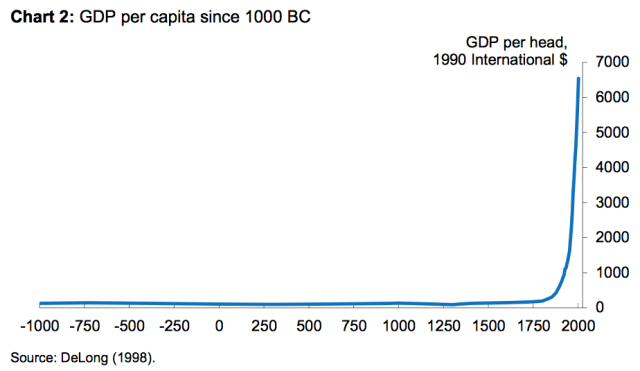 On the other hand, the past 300 years are a blip in human history and have seen unprecedented growth in output. It is hard to argue that these huge outliers represent a trend that must continue. Both sides of the argument can present convincing charts but no graph answers the essential question: What are the last 300 years different? Until we truly understand the changes that began in the Industrial Revolution we cannot begin to predict when our lucky streak will end. Update: Economist points out to me in a comment that I never really excluded the possibility that the first chart demonstrates exponential growth and is just poorly plotted. I grabbed Brad Delong’s estimates of growth since 1 million BC (confidence intervals not included) and plotted it with a logged y-axis but it turns out that the last 300 years is such a blip that it doesn’t even show up! So here is the most misleading chart of the entire post, in which I’ve also logged the time axis to give you a fairly linear relationship in log-log space! Note that the final two plots aren’t appearing on the syndicated sciblogs site. They do appear on the original blog site. Crud, you’re right Marcus. I’ll check into it.